Never one to miss exceptional opportunities, I ask the recruiter on the phone to continue. He had seen digital marketing skills on my LinkedIn profile and told me he had a great position that required extensive experience in paid media and programmatic advertising. When I said my experience is more in content marketing, copywriting and conversion optimization, he seemed frustrated. He told me it’s challenging to staff for digital marketing because the term is so broadly defined, and required skillsets vary greatly from employer to employer. There’s a lot of research to indicate the need to beef up digital marketing skills and many marketers feel like they don’t have a good handle on digital. What should you have in your digital marketing portfolio? Welcome to digital marketing skills 2017. Not surprisingly, two big winners were content marketing, closely followed by Big Data (which includes marketing analytics in this case). 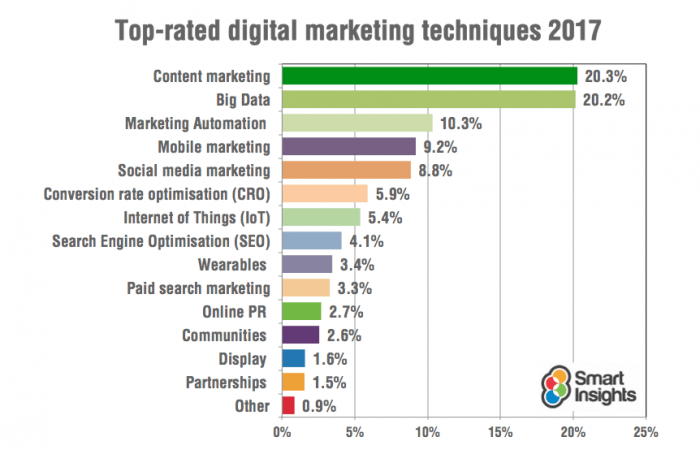 Marketing automation, mobile marketing, social, CRO and SEO also had strong showings. SEO tops the list, a testament to the remarkable traffic potential that comes with showing up at the top of Google search results. A quick look at Google search trends in the past 12 months shows that SEO is far more popular than content marketing, social media marketing or email marketing. What opportunities digital marketers are seeking? What about the other side of the coin? In the same result set, you can get an idea of the jobseeker interest in the same 10 search terms. Not a rigorous analysis, but it’s interesting to see which skills are most important, along with the trends of the past few years. It would be very difficult to have an apples-to-apples comparison with the differences in digital marketing terminology (PPC vs. Pay-Per-Click, for example) and how marketers and employers define terms. 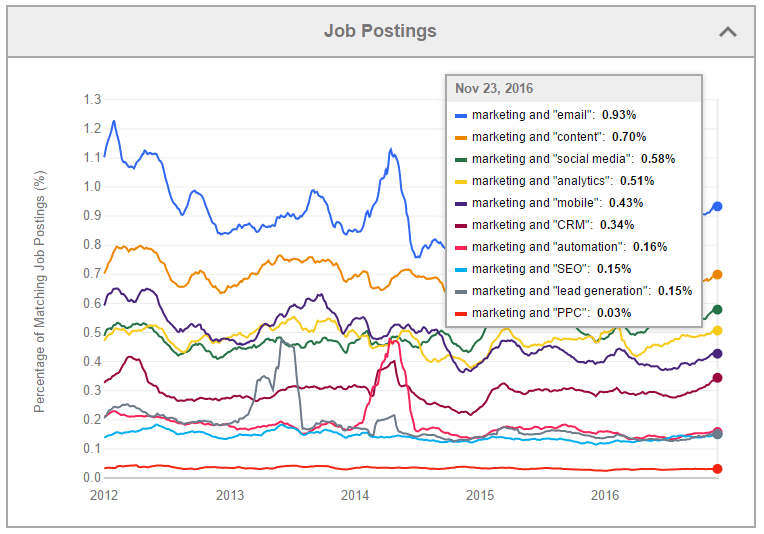 So what’s the bottom line on digital marketing skills 2017? Though the methodology here is far from rigorous, the data do provide some insight into which digital marketing skills are important, from a number of perspectives. There are many definitions of what digital marketing means, and what strategies and tactics it includes. As expected, there is nothing like a consensus ranking of a single Uber digital marketing skill. But gathering the perspectives of marketers, experts, employers and job seekers can provide some insight into what skills are utilized and valued for their results. The data provides an idea of what’s important in digital marketing in 2017. Since the digital marketing world is constantly shifting and evolving, these results will soon be very different. What’s your perspective? Speak your mind in the comments!